ROLLAPIX 100 is the first motorized linear LED luminaire fitted with a 4:1 double zoom system (patent pending). This new generation of luminaires was designed for the entertainment industry in collaboration with a respected French lighting designer and it offers all the new features of 4G technology. 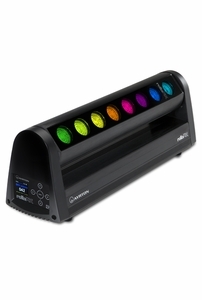 The distinctive characteristic of the ROLLAPIX 100 is to integrate 8 independent 10-Watt RGBW LEDs teamed with two zoom systems, which can be controlled separately in order to create a multitude of diverse effects. The motorization of the tilt axis allows the addition of numerous options to this luminaire, such as the creation of partitions, barriers or mobile virtual doors. The broad zoom range of each LED group enhances the visual effect of the appearance and fading of light when it materializes in atmosphere. Numerous pre-programmed dynamic effects are available in the internal memory, which can be combined with multiple reproduction methods and color macros. The ROLLAPIX 100 is the ideal tool for the creation of virtual lighting décors or for the augmentation of actual architectural constructions on stage.